Many of us have grown accustomed to making a list of foods we want, then heading to the grocery store to buy them. Others have embraced the trend of community-supported agriculture by signing up for shares or participating in community gardens. And then there are the daring folks who march out into urban environments to scope out their next meal. Foraging may also aid national efforts to reduce hunger. University of California, Berkeley, researchers are experimenting with a program that maps edible plants in low-income neighborhoods to empower local residents to find food near their homes.2 Many foragers also donate some or all of their finds to local food pantries. If you want to know more kitchen tips, you better visit this site. Ever felt curious about seeking out your own food in your local environment but held back because you didn’t know where to start? Consider this your cheat sheet for entering the wild world of urban foraging. This point really can’t be stressed enough. 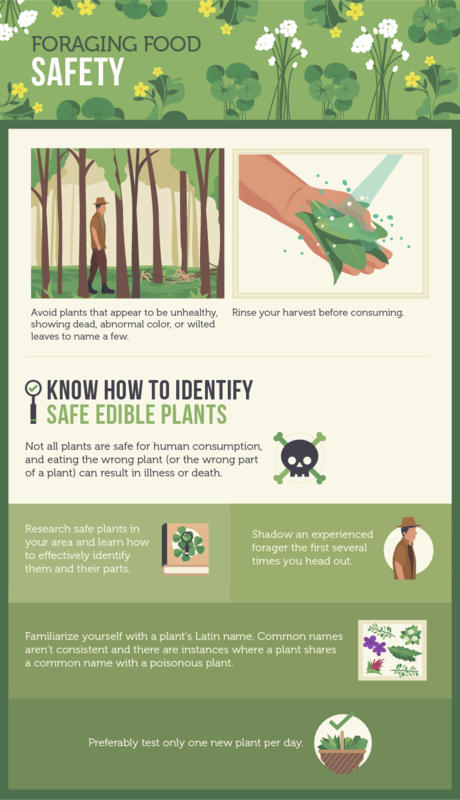 Not all plants are safe for human consumption, and eating the wrong plant (or the wrong part of an otherwise-safe plant) can result in illness or even death.5That’s why it’s critical to research safe plants in your area and learn how to effectively identify them and their parts. It’s particularly helpful to shadow an experienced forager the first several times you head out so you can learn from their know-how. Regardless of whether you forage solo or with a friend, never eat a plant unless you can identify it with absolute certainty. Before picking anything, do some research to figure out where foraging is and is not allowed in your area. In particular, check with local government for any rules regarding foraging on public land.7 If you have your eye on plants that reside on private property, always ask permission before foraging. (If nobody’s home, consider leaving a note with your contact information.8 ) Take note of what grows where and when; foraging is a seasonal enterprise.9 If you encounter a plant that’s past its prime, make a note to return to that same spot earlier next year. Modern foragers can also use the Internet to identify prime foraging spots. Head to fallingfruit.org, which allows foragers from across the globe to share the locations of found fruits, vegetables, herbs, and nuts, to the tune of more than 800,000 entries from 50 countries.10 The searchable map is free to use online and the founders have also created an app for both Android and Apple. Part of reconnecting with the land includes developing an appreciation for all the ways nature sustains us – and it’s important to demonstrate that appreciation by treating the earth with respect. Keep the following rules in mind wherever and whenever you forage. Do not to take more than you can use: One of the goals of foraging is to eliminate, not contribute to, food waste.16 On a similar note, don’t harvest the whole plant if you’re only going to use a specific part, such as the leaves. No matter what, don’t harvest or dig up the roots of a threatened species.17 Feel free to remove invasive species from an area, as they’re not doing the local ecosystem any good. Even as you digest all the serious pointers outlined above, keep in mind that foraging is ultimately meant to be exciting and fun. (Consider it the adult version of a scavenger hunt.) So get out there with your field guide and marvel at all the food nature provides – even in the concrete jungle. This entry was posted in Year Zero Survival Blog and tagged backpacking, camping, fishing, green living, hiking, hunting, outdoors, Preppers, prepping for survival, SHTF, survival, Survival gear, survival hacks, Survival Hunting: Know How, survival skills, survival tips, urban gardening by staff-writer. Bookmark the permalink.